To directly image exoplanets, coronagraphs are usually used to block the light from the host star. Instead of using a traditional coronagraphic phase mask, Jonas Kühn relies on a new, digital technology. His phase coronagraph is an active optical modulator based on a pixelated liquid crystals display panel. In his laboratory at ETH Zurich, the researcher and his collaborators have just validated the promising, new concept for the next generation of exoplanet imagers. In his lab on the ETH Campus Hönggerberg, Jonas Kühn set up an optical bench equipped with two laser diodes to simulate a bright star and a faint off-axis companion, a dozen aspheric lenses, a deformable mirror similar to the one equipping real adaptive optics systems, and a sensitive CCD camera. He points to the centre piece of the installation: a reflective rectangular 2-Mpixels display panel with a length of only 1.5 centimetres, containing electrically-addressable liquid crystals stacked in a pixelated array, which performs as a spatial light modulator (SLM). It allows for manipulating the wavefront – i.e. the path of incoming light – and can be used as a coronagraph killing starlight. Jonas Kühn works as SNF Ambizione Fellow at the Institute for Particle Physics and Astrophysics of ETH Zürich, and is also an associate of the NCCR PlanetS. The liquid crystal molecules have a strong birefringence property to act on the polarization state of the incoming light. By applying a voltage to each pixel, the molecules are tilted and in turn the index of refraction is locally modulated, resulting in a phase retardance for the light propagating through the SLM. 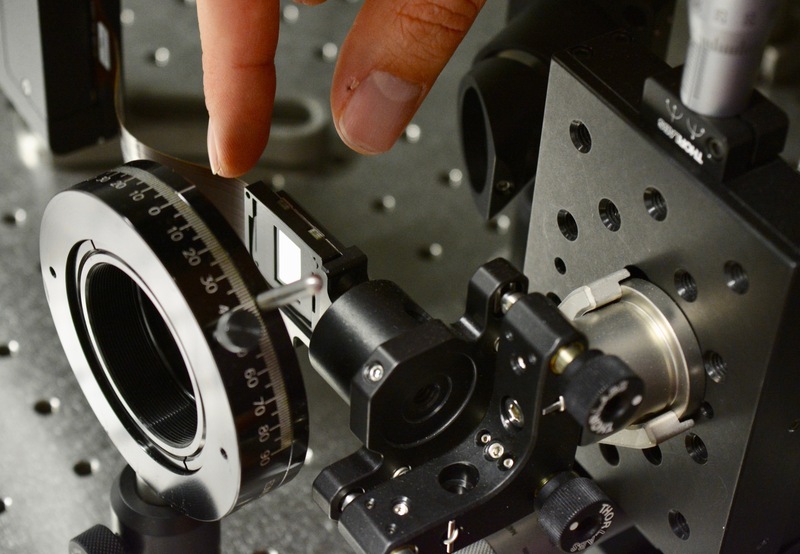 “We can change the refractive index of each pixel 60 times per second,” says Jonas Kühn. Therefore, the SLM is able to perform as an adaptive diffractive phase mask that can adjust to changing conditions at video-rate. “We focus the star on a “phase discontinuity” that we call a “vortex”: it will diffract the starlight away from the optical path, but will leave any off-axis contribution from a planet or circumstellar disk unaffected,” explains Jonas Kühn. This is an important step to enable what is called high-contrast imaging. The challenge is difficult to master: The contrast-ratio of an exoplanet to its host star can range from 1 million to 10 billion to 1 or beyond, depending on the planet mass, temperature, orbital parameters, and host stellar type and age, and this at angular separations as small as a few diffraction beam widths. “It’s like being in Geneva and looking at a dice in Zürich,” says the researcher. The centre piece of the experiment: a pixelated liquid crystals display. So far, only about half-a-dozen exoplanets has been directly imaged – young hot planetary bodies still in formation around very young stars. This was mainly possible thanks to the progress made in adaptive optics, to correct for the Earth atmosphere when observing with the largest ground-based telescopes. However, most telescope entrance pupils usually consist of a complex, sometimes segmented, non-ideal aperture, which includes a central obstruction from the secondary mirror and its support structure. „In practice, this negatively impacts wavefront quality and coronagraphic performances, namely achievable contrast and inner working angle (i.e. how close we can detect companions)“ explains Jonas Kühn. Now, the experiments in his lab demonstrate that the digital adaptive coronagraph could deal with such non-ideal, real-world telescope pupils. “It’s the first-ever experimental validation of this concept,” says the SNF Ambizione Fellow. 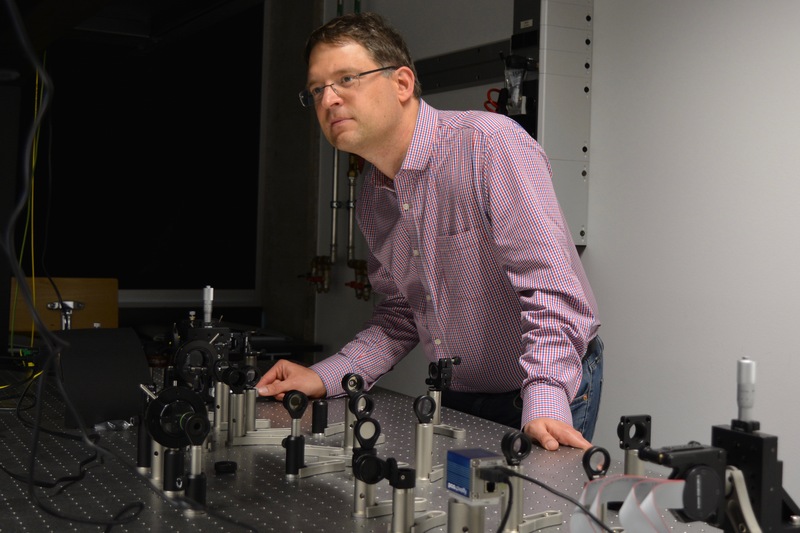 Jonas Kühn made his PhD in photonics at the EPFL and used to work in the field of holographic microscopy. “Back then, I witnessed how digitization changed everything” he recalls and, after a few years working on telescope instrumentation for NASA at the Jet Propulsion Laboratory (JPL) in California, he is convinced that some similar line of events will also take place for coronagraphy. With the upcoming class of extremely large telescopes (ELTs), a reprogrammable device could be especially relevant, since these ELTs will systematically incorporate a segmented primary mirror. In principle, liquid crystal spatial light modulators could dynamically deal with dead, defective or missing mirror segments. Such capability would be even more valuable for future space-based observatories, where human intervention is out-of-question, and mechanically-actuated parts are usually seen as a risk contributor. On the ground, these digital adaptive coronagraphs could also adapt to weather conditions during an observation. The technology is also showing great potential to null several stars at the same time, thus allowing high-contrast imaging of binary or higher order multiple star systems (about 50% of the stars in our galaxy). “None of this is possible with the existing coronographic technology, based on pre-manufactured phase or amplitude masks,” the researcher summarizes. He hopes that in the future a high-contrast imager based on some kind of active adaptive coronagraph will be installed in the E-ELT, on a second generation instrument. Jonas Kühn et al. : Implementing focal-plane phase masks optimized for real telescope apertures with SLM-based digital adaptive coronagraphy, Optics Express 2017.